Last Christmas, Tara got me a Word of the Day calendar. What does she think I am, some kind of grammar nerd?! Anyway. I keep it on my desk at work, and the first thing I do when I arrive in the office every morning is tear off the previous sheet to unveil the new word. I feel just like a kid opening presents on Christmas morning, except I’m not a kid. And there are no presents. And it isn’t Christmas morning. Pesky little details aside, it’s still a lot of fun. Not every word enriches my vocabulary. Some are common. Others, nonsensical. Up until this morning, my favorite had been jerkwater. Meaning remote and unimportant; trivial. I tore that page out and taped it to my filing cabinet. It sounds like a PG-rated insult, and I try to use it often. Thank you, March 23rd. First off, it’s fun to say. 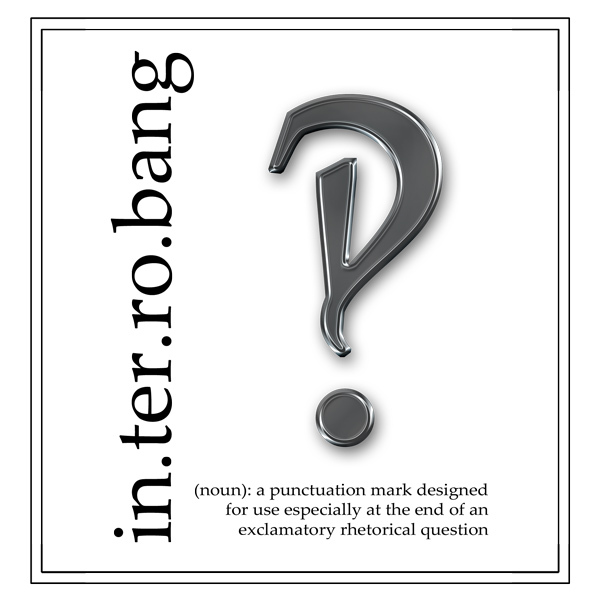 Interrobang. Rolls off the tongue, doesn’t it? And it’s vaguely naughty-sounding. Especially when you have a wife named Tara. Think about it. Best of all, I’ve been using the interrobang for years without even realizing it. Check out my opening paragraph in this post. I’m interrobangin’ like nobody’s business. Who wouldn’t want to interrobang?! Sorry, March 23. Jerkwater is now playing second fiddle to interrobang. Who says English is no fun?! Speaking of fun, this past weekend was. But it almost wasn’t. Tara came up with the idea of heading out of town for a little weekend getaway. She suggested exploring Mount Rainier National Park on Saturday, then staying overnight in Yakima. I’m all for national parks and nature and outdoors. It was the staying-overnight-in-Yakima part that gave me pause. No offense to Yakimans. (Yakimen? Yakiwomen? I could really use some Word of the Day help right about now). It just didn’t sound very exotic. Never been there, never had any desire to be there. But I figured life is one big adventure anyway, and maybe Yakima wouldn’t prove to be so jerkwater after all. And then the weather became an issue. It’s been an abnormally hot and dry summer throughout the Pacific Northwest, so naturally – on the one day where we planned on spending approximately 100% of our time outdoors – it decided to rain. Oh, and it was cold, too. 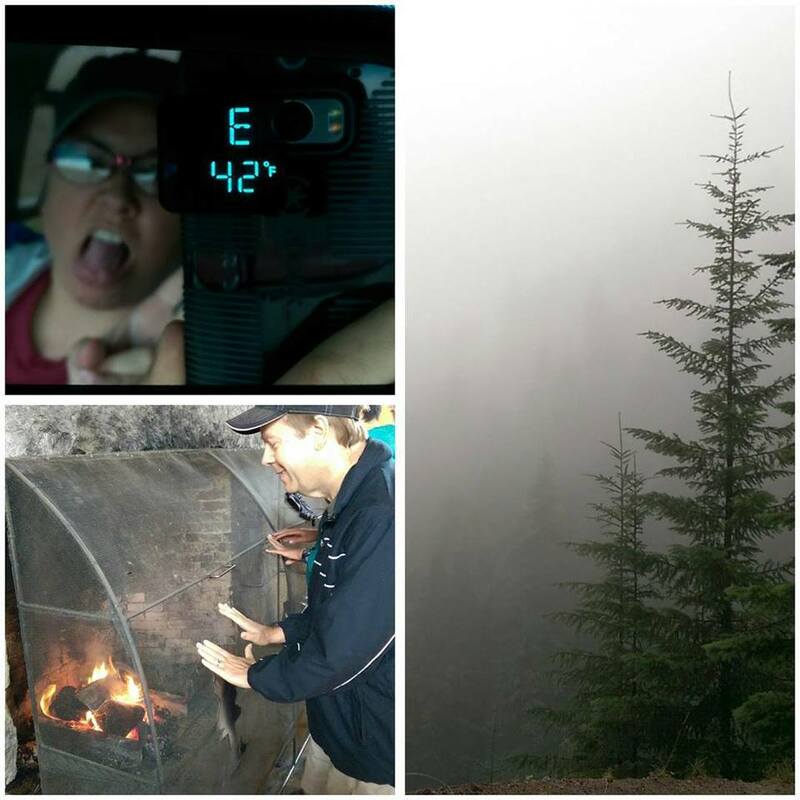 When we reached the Sunrise Visitor’s Center it was 42 degrees and we had to warm up in front of a blazing fire. I kid you not. Though our view was decidedly less impressive. And then, when all hope appeared lost, we noticed that the rain had stopped. Sure, it was still foggy. And cold. The air was damp. But there was no precipitation precipitating, and that made all the difference in the world. So we pulled into the parking lot at Tipsoo Lake and, just for fun, began walking the Naches Peak Loop trail. 3.8 miles and two hours later we had completed what turned out to be one of the best hikes we’ve ever done. At one point as we traversed a ridge line the clouds below us parted and raced through the valley, lending an ethereal quality to the place. There were alpine lakes and wildflowers and acres of huckleberry bushes laden with ripe, succulent fruit. The views were breathtaking. The sun even came out briefly. It was nothing short of spectacular. Bonus: 0% chance of sunburn. And you know what? Yakima, despite its essential Yakimaness, proved to be a good spot to hole up overnight. It was only 60 miles east of the park and had an honest to goodness real restaurant with tasty, strong cocktails. We imbibed in a few, and ate spring rolls and wild Alaskan salmon and a pork chop with bacon jam and the next morning bought fruit and vegetables from the farmer’s market and well, damn it all, we ended up liking Yakima. Go figure. Not a bad weekend at all! And then interrobang eased my Monday morning transition to the workplace. Entrance to Mount Rainier National Park. Fortunately, we didn’t see any. Loving the views. And each other. We walked part of the PCT. Huckleberries! Be still my berry lovin’ heart. Yes, it sure does, Mark! And I thought the same thing…NAUGHTY-SOUNDING 🙂 I think I’ll have to try that word at work tomorrow. OMG, how fabulous! July and 42 degrees?!? It reminds me of spending a summer in Lake Tahoe and how it would be in the high 80’s-90’s during the day and then suddenly dropped down into the 50’s and 40’s at night. GORGEOUS photographs! I especially love the foggy mountain shots. Oh, and did you see any BEARS??? Great shot of you and Tara too! It WAS fabulous! Especially looking at the forecast for Portland. Highs for the next 5 days: 95, 97, 96, 93, 92. Ugh. 42 was AWESOME!! Hope you’re getting decent weather in Philly. We did not see any bears, but we saw plenty of signs of bears, if you catch my drift. Luckily we did not step in any of those signs. Usually when one learns a new word, you start to notice it while reading, etc. I don’t see that happening with interrobangin! Your trip looks fantastic, except for the 42 degrees. I love those calendars! I buy them for myself. I have never gotten that word, I would remember it. Yakima is a cool town. You showed me blueberries. I miss blueberries straight off the bush. I love blueberries! But these are actually huckleberries, which are even better. Smaller and more intensely flavored. So, so good! Oh, I love those also! I am so envious. Nerdjacker is another one of those kind of words. It is a person who sends an otherwise interesting conversation careening over a cliff. “What are you, some kind of Nerdjacker? !” gets used quite a lot around our house. I love nerdjacker! I’m definitely going to add that one to my vocabulary. Thank you for enlightening me. Today’s word of the day is “calliope,” which is nowhere near as exciting. Hike ? I don’t think I drive that much in a day. 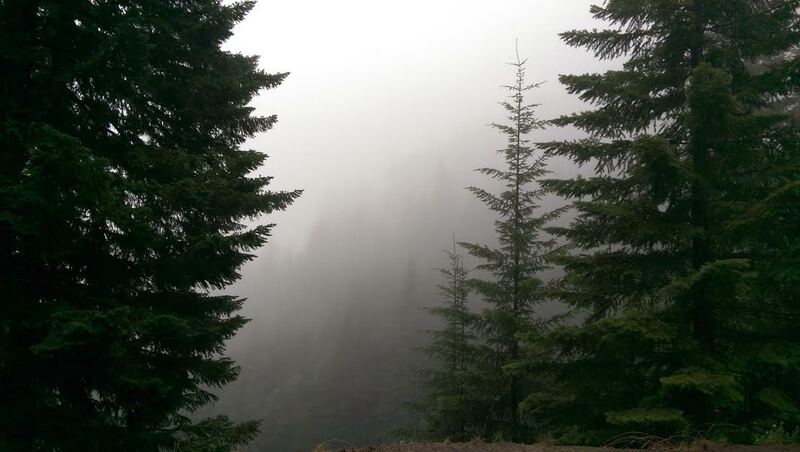 Foggy views are the worst when you wake up early or hike to get somewhere! But that picture of you and Tara is adorable.